eWay-CRM Mobile is available for all smart phones with Android or iOS operating systems. Version for Android and version for iOS can differ. You are inserting web service address while you want to login to eWay-CRM. Make sure your web service is on HTTPS address - server that supports SSL certificates. It is possible that smart phones will not support HTTP addresses in the future. 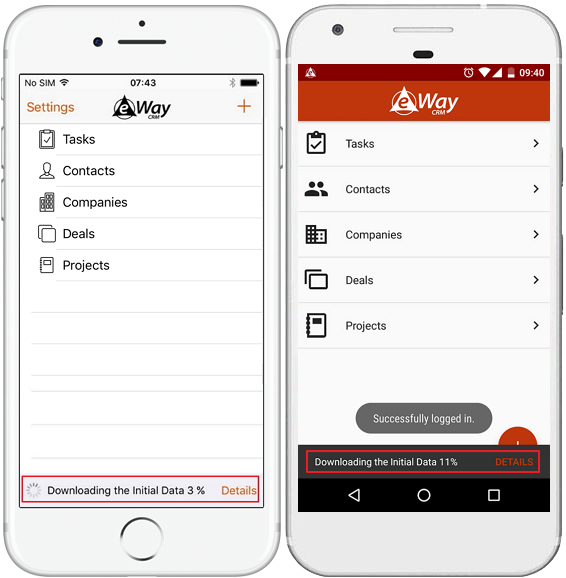 Important: If the eWay-CRM database contains hundreds of thousands items in HUB or tens of thousands items in main modules (contacts, companies, deals and projects), the recommended requirements are necesary for the smooth function of eWay-CRM Mobile. eWay-CRM Mobile is compatible with eWay-CRM Premium only. To upgrade your Free version to Premium, follow this instruction. Go to the Google Play Store / App Store. Now, the application is installed on your phone. We recommend that you switch to a Wi-Fi connection if possible for the initial synchronization while eWay-CRM is uploading data on your mobile phone. The default language of eWay-CRM is English. There is also Czech version of application. If you have set Czech as language on your phone, eWay-CRM will be displayed in Czech. For other language settings of your mobile phone, eWay-CRM will be displayed in default language. Tap on the eWay-CRM icon and type in your credentials for the first time. Use Webservice address, Username and Password for your Premium account. Credentials are same as you are using for login to eWay-CRM in Microsoft Outlook - see How to Set or Change Web Service Address. Click LOG IN and your first synchronization will start immediately. Before login, you can choose whether you want to use your cellular data for synchronization. Use Cellular Data need to be unmarked if you do not want to use them. Important: Initial synchronization of large database can use significant amount of your cellular data. But do not worry, if you want to use cellular data and your WiFi goes offline, you will be asked whether you really want to use cellular data for large synchronization. After the login, you will see the main screen of eWay-CRM Mobile and a notification about the status of synchronization at the bottom of the screen. You can click Details to see the progress of the synchronization. Or swipe from the top of the screen to see the progress bar as a notification on your Android phone. You can use the application even when the synchronization is not complete, but we recommend to wait until data is synchronized between your phone and the database. If you need our assistance, contact us through the contact form on our web-site or email us at [email protected]. Tap Settings in the main activity of eWay-CRM Mobile. Change your credentials to those you want to log to them and click Log In. When you click Log In and your credentials are correct, initial synchronization of new account will start. Log In section allows you to change whether you want use cellular data for synchronization. This setting is not dependent on login itself. If you want to change cellular data setting, you do not need to confirm it by clicking Log In button. Important: Synchronization of large database can use significant amount of your cellular data. But do not worry, if you want to use cellular data and your WiFi goes offline, you will be asked whether you really want to use cellular data for large synchronization. Tap the three dots icon in the top right corner of the screen. Now, your eWay-CRM account is removed.